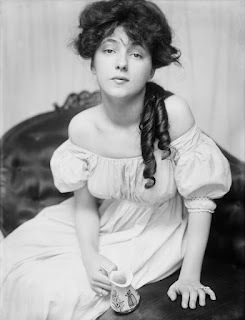 Evelyn Nesbit was the most beautiful woman in America. If she wore her hair in curls, every woman wore her hair in curls. Her lover was the eminent architect, Stanford White, designer of the Pennsylvania Station on 33rd Street. Her husband, the eccentric millionaire, Harry K. Thaw, was a violent man. After her husband shot her lover, Evelyn became the biggest attraction in vaudeville since Tom Thumb. The portrayal of Evelyn Nesbit and the "Trial of the Century" is treated pretty lightly in the musical. After seeing Velvet Swing and its exploration of Evelyn Nesbit's home life, her suitors and relationships, Doctorow's (and the musical's!) treatment of her seems harsh and dismissive. Although I love Ragtime, I never considered the complexity of her story as well as the male gaze her story is told through. It's a bit of a musical theater epiphany and for that, thank you Umbrella Collective. 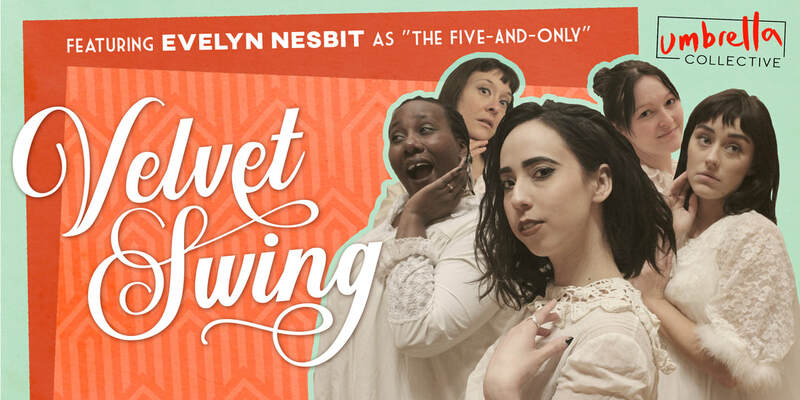 Velvet Swing, conceived by Alana Horton, directed by Alana Horton and Megan Clark, was created with Umbrella Collective and the ensembles and tells enough of Nesbit's story to leave you wanting more. Umbrella Collective takes a fascinating tack to tell this story. Five actors (Meredith Kind, Natavia Lewis, Antonia Perez, Jessie Scarborough-Ghent, and Mickaylee Shaughnessy) play Evelyn Nesbit as well as every other character in the story. Although they use minimal props, costume changes and set, their characterizations are sharp and clear. All of the performers are terrific in all of their roles. Additional narration and commentary is provided by music designer and pianist Michelle Hernick, whose subtle but appropriate accompaniment adds even more layers to this play. Having Evelyn Nesbit, a vulnerable character, played by five women gives the ability for the play to comment on the action and provide a valuable modern context. Although this could be awkward, it's beautifully and smoothly done in this play and reminded us of Roe at Mixed Blood Theatre, which also examined a historical character in-depth using a meta-modern lens. We also love the supplementary educational opportunities that Umbrella Collective is offering: Pre-Show: Dinner and Cocktails with the creative team; a Post-Show panel with dramaturg Jo Holcomb. You can find more info on their website and download the program, which has a brief history of Evelyn Nesbit as well as recommended podcasts (yay!) and reading. Sometimes, after seeing a biographical or historical play, I think: "Well, that's all I need to know about that person or event." But not with this show. Umbrella Collective does such a beautiful job of retelling this story through a modern lens, it made me want to know more and think more about how women's stories have been told through the years. TL, DR: Go see this play.